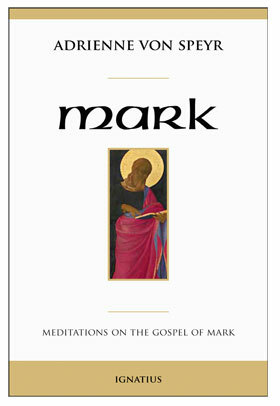 These meditations on the Gospel of Mark, with the exception of the second part on the Passion, were given by Adrienne von Speyr between 1945 and 1958 to members of the Community of St. John, which she founded with the renowned theologian, Fr. Hans Urs von Balthasar. Adrienne is speaking to young adults who have decided to live the state of the evangelical counsels in a secular profession, as part of a recently established secular institute. Nevertheless this contemplative commentary can be very useful for all who seek to meditate on Holy Scripture. As always, Adrienne here draws from the abundance of her own contemplation which keeps continually in view the harmonious unity of Christian dogmatic truth; she gives to others what has been offered to her in contemplation, without exegetical notes or any attempt at scholarship. Since she is speaking to novices, the train of thought is simple and practical, yet rich in depth. Adrienne von Speyr (1902-1967) was a contemporary Swiss convert, mystic, wife, medical doctor, and author of over sixty books on spirituality and theology. She entered the Church under the direction of the great theologianHans Urs von Balthasar. The short bio of von Speyr that follows is based on von Balthasar’s book, First Glance at Adrienne von Speyr (Ignatius, 1981), the most detailed and thorough introduction to her life, theology, and work. Adrienne was born on September 20, 1902 in the city of La Chaux-de-Fonds, Switzerland into a Protestant family. Her father, Theodor von Speyr was an opthamologist. Her mother, Laure Girard, was the descendant of a family of noted watchmakers and jewelers from Geneva and Neuenburg. Adrienne was the second child. Her sister Helen was a year-and-a-half older. Her first brother, Wilhelm, a physician, was born in 1905 and died in 1978. Her second brother, Theodor, was born in 1913 and was director of a bank in London for many years. Adrienne’s mother scolded her daily; this led to Adrienne forming a strong trust and devotion to God, as well as a recognition of the meaning of sacrifice and renunciation. She also formed a deep relationship with her grandmother, a holy and pious woman. Adrienne also had a devotion to her father, who treated her with mutual respect and understanding, often taking her with him to the hospital to visit sick children. And in her primary school years she began working with the poor and even formed a society with her friends for those living in poverty. A very bright student, Adrienne occasionally substituted for one of her teachers who suffered from asthma. It was in her religion classes that she began to sense the emptiness of the Protestantism that was being offered to her. Incredibly, at the age of nine she gave a talk to her classmates about the Jesuits: an “angel” had told her “that the Jesuits were people who loved Jesus totally, and that the truth of God was greater than that of men, and as a result one could not always tell people everything exactly as one understands it in God” (First Glance at Adrienne von Speyr, 21). (When she was six years old, Adrienne told Balthasar, she had a mysterious encounter with St. Ignatius while walking up a steep street on Christmas Eve.) In her secondary school years she reproached her religion teacher for failing to discuss other religious beliefs, especially Catholic teachings. Adrienne was often sick and had constant backaches that forced her to lie down for long periods of time. She would always become ill before Easter; she explained that it was due to Good Friday. Despite her physical sufferings, she focused on helping others who were suffering, spending time comforting and encouraging hospital patients. Not surprisingly, she went to secondary school with the intention of becoming a doctor, a decision supported by her father but not her mother. And after two years of secondary school, her mother was successful in having her removed on grounds that it allowed too much association with boys. Adrienne then spent a year in an advanced girls’ school; although unhappy, she met her best friend, Madeleine Gallet. The two of them talked constantly about God, the spiritual life, and how they might convert their classmates. Adrienne’s father permitted her to return to secondary school. Although she was the only girl in her class, she was very popular due to her charm and humor and natural leadership. In November 1917 she experienced a mystical vision, an appearance of Mary surrounded by angels and saints; her later work would always be marked with a deeply Marian character. Around this same time she knew, somehow, that her father would soon die. After his death (from a perforated stomach), Adrienne attended both business school and secondary school. In 1918 she suffered a total physical collapse brought on by tuberculosis in both lungs. The doctors believed she would die within a year. She was sent to Leysin; there she was cared for by Charlotte Olivier, a relative by marriage and a doctor. Meanwhile, her mother distanced herself even further from her. Adrienne spent time reading and learning Russian. It was in Leysin–where she would often pray in a cold Catholic chapel–that Adrienne began to see that she was being called to the Catholic Church. There was another physical collapse, followed by a return to school. In the summer of 1927 she met a history professor, Emil Dürr, a widower with two young sons. They married, but he died suddenly in 1934. Adrienne had passed her state boards shortly after her wedding; she was the first woman in Switzerland to be admitted to the medical profession. In 1936 she married Werner Kaegi, an associate professor under Dürr who took over his Chair of History at the University of Basel. During the next few years Adrienne made several failed attempts to contact Catholic priests to inform them of her desire to convert. In the fall of 1940 she was introduced to Fr. Hans Urs von Balthasar (then a Jesuit), recently appointed as student chaplain in Basel. She told him of her desire to become Catholic and she was baptized on the feast of All Saints and was soon confirmed. Her family was initially shocked; it would take years for reconciliation to slowly take place. But she formed friendships with many great Catholic thinkers: Romano Guardini, Hugo Rahner, Erich Przywara, Henri de Lubac, Reinhold Schneider, Annette Kolb, and Gabriel Marcel. Her medical practice was very successful; she had as many as sixty to eighty patients a day. Von Balthasar wrote that shortly after her conversion, “a veritable cataract of mystical graces poured over Adrienne in a seemingly chaotic storm that whirled her in all directions at once. Graces in prayer above all: she was transported beyond all vocal prayer or self-directed meditation upon in order to be set down somewhere after an indeterminate time with new understanding, new love and new resolutions.” This included “an increasingly open and intimate association with Mary…” Driving home one night shortly after her conversion, she saw a great light in front of the car and she heard a voice say: Tu vivra au ciel et sur lat terre (You shall live in heaven and on earth). This was “the key to all that was to follow” in her life. By 1954 Adrienne was so ill that she had to discontinue her medical practice. She spent hours each day in prayer, knitting clothing for the poor, and reading Bernanos and Mauriac, among other French authors. From her mid-fifties on, she was so ill that physicians wondered how she could remain alive. In 1964 she went blind; her last months were filled with “continuous, merciless torture,” said Balthsar, “which she bore with great equanimity, always concerned about the others and constantly apologetic about causing me so much trouble.” She died on September 17, 1967, the feast of St. Hildegard, also a mystic and a physician. She was marked by humour and enterprise. She was like the boy in the fairy tale who sets off to experience fear. At her mother’s instigation she had to leave high school but secretly studied Greek at night by the light of a candle, so she could keep up with the others. In Leysin she learned Russian. After her transfer to the high school in Basel, she quickly learned German and at the same time took a crash course in English to catch up with the rest of the class. As I said, she paid for her medical studies by tutoring. Then there is her courageous readiness to stand up for justice. When a teacher struck a boy in the face with a ruler, she rushed forward, turned the teacher to the face the class, and shouted: “Do you want to see a coward? Here’s one!” On one occasion in the lecture theatre an intern gave an injection to a patient which promptly killed him. The intern falsely blamed it on the nurse and was defended by the professor. Adrienne got her fellow students to boycott the professor’s lectures for so long that he had to move to another university. It was precisely this courage, maintained in the face of the most extreme physical pain, which enabled her after her conversion to take on, for decade after decade, every kind of spiritual and bodily suffering, especially participation in the agony of Christ in Gethsemane and on the Cross. Indeed, when she realised its significance for the reconciliation of the world, she constantly asked for it. A different approach to her work is offered by her smaller, treatise-like works, which develop a special aspect of her theological vision. Before all others, the Handmaid of the Lordshould be read, then works of smaller scope like the Gates of Eternal Life, The Immeasurable God, The Face of the Father, and similar ones. From this point, the more extensive works like The World of Prayer and Confession are more easily accessible. Ignatius Press has been translating and publishing many of the works of Adrienne von Speyr since the early 1980s. Here is a listing of her books currently available from Ignatius Press. Adrienne von Speyr, a renowned mystic and spiritual writer from Switzerland, was received into the Catholic Church at the age of 38 on the Feast of All Saints, 1940, by one of the theological giants of the 20th century, Fr. Hans Urs von Balthasar. 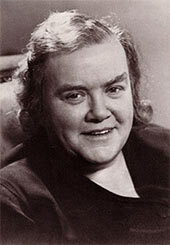 He became her spiritual director and confessor until her death in 1967 during which time Adrienne was favored with many gifts of authentic mystical prayer. Balthasar considered one of the central characteristics of Adrienne’s prayer to be her transparency to the inspirations she received from God, along with a deep personal communion with the saints. Over a period of many years, Adrienne would see the saints (and other devout people) at prayer, and she would dictate what she saw to Fr. von Balthasar–while she was in a state of mystical prayer. Through a unique charism, she was able to put herself in the place of various individuals to see and describe their prayer, their whole attitude before God. Not all of her subjects are saints in the strict sense of the word, but all struggled, with varying degrees of success, to place their lives at the disposal of their Creator. This book presents these unique mystical insights into the prayer lives of many saints taken from Adrienne’s direct visions of them in prayer. Among the long list of saints in this book are St. John the Apostle, St. Augustine, St. Francis, St. Thomas Aquinas, St. Ignatius of Loyola, St. Teresa of Avila, St. John of the Cross, St. John Bosco, St. Bernadette, St. Dominic, St. Edith Stein and many, many more. In this powerful spiritual work, the reader is able to participate in the devotional and spiritual life of the Church throughout the centuries by learning how numerous saints and devout people prayed, thus reflecting on the timelessness and beauty of the prayer of the Church. • Visit the Book of All Saints website for more info, photos, and other materials. In Hans Urs von Balthasar’s masterwork, The Glory of the Lord, the great theologian used the term “theological aesthetic” to describe what he believed to the most accurate method of interpreting the concept of divine love, as opposed to approaches founded on historical or scientific grounds. 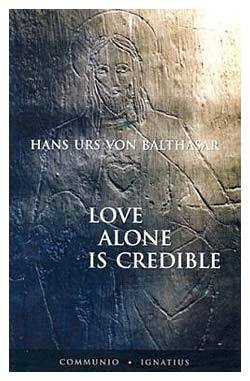 In the newly translated Love Alone Is Credible, von Balthasar delves deeper into this exploration of what love means, what makes the divine love of God, and how we must become lovers of God in the footsteps of saints like Francis de Sales, John of the Cross and Therese of Lisieux. Similarly, a person who contemplates a great work of art has to have a gift–whether inborn or acquired through training–to be able to perceive and assess its beauty, to distinguish it from mediocre art or kitsch. This preparation of the subject, which raises him up to the revealed object and tunes him to it, is for the individual person the disposition we could call the threefold unity of faith, hope, and love, a disposition that must already be present at least in an inchoative way in the very first genuine encounter. And it can be thus present because the love of God, which is of course grace, necessarily includes in itself its own conditions of recognizability and therefore brings this possibility with it and communicates it. After a mother has smiled at her child for many days and weeks, she finally receives her child’s smile in response. She has awakened love in the heart of her child, and as the child awakens to love, it also awakens to knowledge: the initially empty-sense impressions gather meaningfully around the core of the Thou. Knowledge (with its whole complex of intuition and concept) comes into play, because the play of love has already begun beforehand, initiated by the mother, the transcendent. God interprets himself to man as love in the same way: he radiates love, which kindles the light of love in the heart of man, and it is precisely this light that allows man to perceive this, the absolute Love: “For it is the God who said, ‘Let light shine out of darkness’, who has shown in our hearts to give the light of the knowledge of the glory of God in the face of Christ” (2 Cor 4:6). In this face, the primal foundation of being smiles at us as a mother and as a father. insofar as we are his creatures, the seed of love lies dormant within us as the image of God (imago). But just as no child can be awakened to love without being loved, so too no human heart can come to an understanding of God without the free gift of his grace–in the image of his Son. Prior to an individual’s encounter with the love of God at a particular time in history, however, there has to be another, more fundamental and archetypal encounter, which belongs to the conditions of possibility of the appearance of divine love to man. There has to be an encounter, in which the unilateral movement of God’s love toward man is understood as such and that means also appropriately received and answered. If man’s response were not suited to the love offered, then it would not in fact be revealed (for, this love cannot be revealed merely ontologically, but must be revealed at the same time in a spiritual and conscious way). But if God could not take this response for granted from the outset, by including it within the unilateral movement of his grace toward man, then the relationship would be bilateral from the first, which would imply a reduction back into the anthropological schema. The Holy Scriptures, taken in isolation, cannot provide the word of response, because the letter kills when it is separated from the spirit, and the letter’s inner spirit is God’s word and not man’s answer. Rather, it can be only the living response of love from a human spirit, as it is accomplished in man through God’s loving grace: the response of the “Bride”, who in grace calls out, “Come!” (Rev 22:17) and, “Let it be to me according to your word” (Lk 1:38), who “carries within the seed of God” and therefore “does not sin” (i jn 3:9), but “kept all of these things, pondering them in her heart” (Lk 2:19, 51), She, the pure one, is “placed, blameless and glorious” (Eph 5:26-27; 2 Cor 11:2) before him, by the blood of God’s love, as the “handmaid” (Lk 1:38), as the “lowly servant” (Lk 1:48), and thus as the paradigm of the loving faith that accepts all things (Lk 1:45; 1I:28) and “looks to him in reverent modesty, submissive before him’ (Eph 5:24, 33; Col 3:18). Had the love that God poured out into the darkness of nonlove not itself generated this womb (Mary was pre-redeemed by the grace of the Cross; in other words, she is the first fruit of God’s self-outpouring into the night of vanity), then this love would never have penetrated the night and it would never in fact have had the capacity to do so (as a serious reading of Luther’s justus-et-peccator theology illuminates in this regard). To the contrary, an original and creaturely act of letting this be done (fiat) has to correspond to this divine event, a bridal fiat to the Bridegroom. But the bride must receive herself purely from the Bridegroom ([kecharitoméne] Lk 1:28); she must be “brought forward” and “prepared” by him and for him ([paristánai] 2 Cor 11:2; Eph 5:27)  and therefore at his exclusive disposal, offered up to him (as it is expressed in the word [paristánai]; cf. the “presentation” in the temple, Lk 2:22 and Rom 6:13f; 12:1; Col 1:22, 28). This originally justified relationship of love (because it does justice to the reality) in itself threads together in a single knot all the conditions for man’s perception of divine love: (1) the Church as the spot less Bride in her core, (2) Mary, the Mother-Bride, as the locus, at the heart of the Church, where the fiat of the response and reception is real, (3) the Bible, which as spirit (-witness) can be nothing other than the Word of God bound together in an indissoluble unity with the response of faith. A “critical” study of this Word as a human, historical document will therefore necessarily run up against the reciprocal, nuptial relationship of word and faith in the witness of the Scripture. The “hermeneutical circle” justifies the formal correctness of the word even before the truth of the content is proven. But it can, and must, be shown that, in the relationship of this faith to this Word, the content of the Word consists in faith, understood as the handmaid’s fiat to the mystery of the outpouring of divine love. But insofar as the Word of Scripture belongs to the Bride-Church, since she gives articulation to the Word that comes alive in her, then (4) the Bride and Mother, who is the archetype of faith, must proclaim this Word, in a living way, to the individual as the living Word of God; and the function of preaching (as a “holy and serving office”), like the Church herself and even the Word of Scripture, must be implanted by the revelation of God himself, as an answer to that revelation, as it is illuminated by the relationship between the Church and the Bible. It is not necessary to measure the full scope of the faith achieved in human simplicity and in veiled consciousness in the chamber at Nazareth and in the collegiurn of the apostles. For the unseen seed that was planted here needed the dimensions of the spirit or intellect to germinate: dimensions that, once again, stand out in a fundamental and archetypal way in the Word of Scripture, but which first unfold in the contemplation of the biblical tradition over the course of centuries–”written on the tables of our hearts” and henceforth “to be known and read by all men” (2 Cor 3:2-3), written “in persuasive demonstrations of spirit and power”, spirit as power and power as spirit (i Cor 2:4). That which the “Spirit” of God, however, interprets in our hearts with “power” (and which the Church interprets in “service to the Spirit” [2 Cor 3:8]) is nothing other than God’s own outpouring of love in Christ; indeed, the Spirit is the outpouring of the Son of God, “the Spirit of the Lord” (2 Cor 3:18), since the Lord himself “is Spirit” (2 Cor 3:17). When Christ is immediately thereafter designated the “Image of God” (2 Cor 4:4), then this expression ought not to be reduced to mythical terms, since myth was definitively left behind with the dimension of the Incarnation of the Word, which surpassed it. He is the “Image”, which is not a merely natural or symbolic expression, but a Word, a free self-communication, and precisely therefore a Word that is always already (in the grace of the Word) heard, understood, and taken in, otherwise, there would be no revelation. There is no such thing as a “dialogical image”, except that which exists at the higher level of the Word, although it remains true–and contrary to what Protestant and existential theology may claim–that the Word preserves and elevates in itself all the value of the image at the higher level of freedom. if the Word made man is originally a dialogical Word (and not merely in a second moment), then it becomes clear that even the level of the unilateral (ethical-religious) teaching of knowledge has been surpassed. It is not possible that Christ could have written books (“about” something, whether about himself, about God, or about his teaching); the book “about” him must concern the trans-action between him and the man whom he has encountered, addressed, and redeemed in love. This means that the level on which his Holy Spirit expresses himself (in the letter), must necessarily itself be “in the spirit” (of the love of revelation and the love of faith), in order to be “objective” at all. To put it another way, the site from which love can be observed and generated cannot itself lie outside of love (in the “pure logicity” of so-called science); it can lie only there, where the matter itself lies–namely, in the drama of love. No exegesis can dispense with this fundamental principle to the extent that it wishes to do justice to its subject matter. Augustine offers a magnificent description of the archetypal prius, of the perfect Yes in theConfessions (XII, 15; PL 32, 833): “Do you deny that there is a sublime created realm cleaving with such pure love to the true and truly eternal God that, though not coeternal with him, it never detaches itself from him and slips away into the changes and successiveness of time, but rests in utterly authentic contemplation of him alone? . . . We do not find that time existed before this created realm, for ‘wisdom was created before everything’ (Eccles. [Sir] 1:4). Obviously this does not mean your wisdom, our God, father of the created wisdom … [but] that which is created, an intellectual nature which is light from contemplation of the light. But just as there is a difference between light which illuminates and that which is illuminated, so also there is an equivalent difference between the wisdom which creates and that which is created, as also between the justice which justifies and the justice created by justification. . . . So there was a wisdom created before all things which is a created thing, the rational and intellectual mind of your pure city, our ‘mother which is above and is free’ (Gal 4:26)…. O House full of light and beauty! 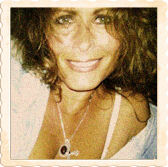 … During my wandering may my longing be for you! I ask him who made you that he will also make me his property in you, since he also made me” (Confessions, trans. Henry Chadwick [Oxford: Oxford University Press, 1991; reissued as an Oxford World’s Classics paperback 1998], 255-56). Hans Urs von Balthasar (1905-88) was a Swiss theologian, considered to one of the most important Catholic intellectuals and writers of the twentieth century. Incredibly prolific and diverse, he wrote over one hundred books and hundreds of articles. Read more about his life and work in the Author’s Pages section of IgnatiusInsight.com. Dr. Scott Hahn was born in 1957, and has been married to Kimberly since 1979. He and Kimberly have six children and are expecting their fifth grandchild. An exceptionally popular speaker and teacher, Dr. Hahn has delivered numerous talks nationally and internationally on a wide variety of topics related to Scripture and the Catholic faith. Hundreds of these talks have been produced on audio and videotapes by St. Joseph Communications. His talks have been effective in helping thousands of Protestants and fallen away Catholics to (re)embrace the Catholic faith.